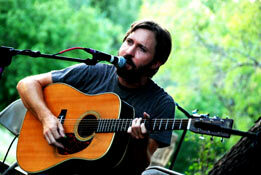 When we found out about Owen Temple's Frio River Song Festival it didn't take long to start making plans. 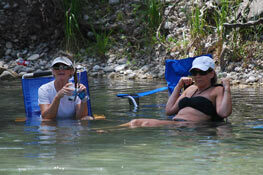 We have been waiting for an excuse to head down to Concan and the Frio River and this seemed like a no-brainer! And it didn't take more than five minutes to get a confirmation of "let's do it" from Mrs Texas Outside, our two daughters and their family, my brother, and some good friends in Dallas. Now we just had to find a place that would sleep 10 adults and 4 grand kids under 5! We had heard some good things about Frio Country Resort and in fact, Owen's festival was being held in one of their cabins on Friday night and at their House Pasture Cattle Company restaurant on Saturday. So Frio Country was another no-brainer. 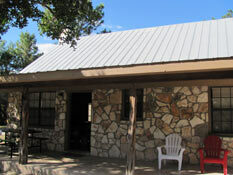 Wow, was I impressed when I started looking at our lodging options with Frio Country Resort. They have a wide variety of lodging ranging from one bedroom rustic cabins for two to four bedroom four bath upscale homes with swimming pools and more! Our cabin had a hunting theme and was clean, rustic, comfortable, very functional, and affordable - for the price we didn't expect upscale appointments. The cabins have the bare essentials for a fun vacation but you'll need to bring linens, towels, soap, and shampoo. Shortly after arriving, unpacking, checking out the river, and downing a couple cold beers we set off for Friday nights music which was just up the road in the back yard of one of the Frio Country Resort rental cabins. 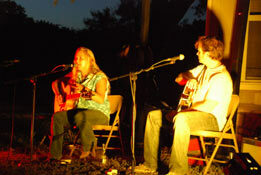 Owen had set up some mics and speakers and a couple folding chairs around which a small group of music lovers set up their lawn chairs, blankets, and coolers for a night of acoustic music under the stars. For the next three hours, eight of some of the best Texas singer songwriters entertained us with some of their best songs and stories. 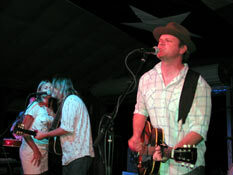 You can read more about this outstanding event by reading our review of Frio River Song Festival. Saturday we all slept in and after a leisurely breakfast we grabbed our lawn chairs and coolers and headed down to spend the rest of the day enjoying the Frio River. When we were there the Frio River was gently flowing with barely enough water to navigate down river in tubes, kayaks, or rafts. The water is clear and cool and it's a beautiful setting with the tall trees and rolling hills lining the river bank. We found a a deep pool, set up the lawn chairs, popped a cold one and spent the rest of the afternoon enjoying the river. We were right next to a little chute that was fun body rafting down - my big bottom found the rocks quite frequently and if I could have seen it, I'm sure it would have been black and blue. And we got to watch all the tubers negotiate their way down the river. It's amazing what you'll see and hear as the friendly tubers float by - boom boxes blaring with everything from county to jazz, tubes of all shapes and sizes, a wide variety of contraptions to hold food and drinks, plus canoes, kayaks, and rafts full of fun loving people of all ages having a great time. 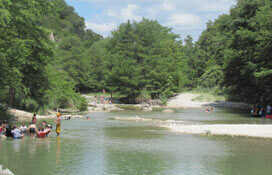 Some of us sit in our chairs smack dab in the middle of the river, others took hikes up to the top of one of the nearby hills, some moseyed up and down the Frio River in search of a perfect swimming hole, and the grand kids had a blast enjoying the refreshing river on a hot day. Fun afternoon in the river. You can rent tubes, kayaks, or rafts from several different locations, including Frio Country Resort, and all of the tube rental locations provide a shuttle service. All too soon it was time to drag our water logged bodies back to the cabin to get ready for dinner and the evening's music, both of which were at House Pasture Cattle Company. 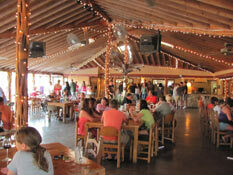 The House Pasture Cattle Company is part of Frio Country Resort and they serve some great food at reasonable prices and have a fantastic covered outdoor pavilion with a stage for music. Adjacent to the outdoor pavilion is a big patio with picnic tables, a grassy area with horseshoe and washer pits, a kids playground, and a bar area. The House Pasture serves a variety of appetizers, salads, and entrees including steak, chicken fried chicken, ribs, pork chops, fish, hamburgers, and lots more. You can eat inside, under the pavilion, or out on the patio area. We made sure we got there early to get a table under the pavilion and right in front of the dance floor and stage. And until the food came and the music started the grand kids enjoyed the playground and the guys had a few competitive rounds of horseshoes and washers - with the losers buying a couple rounds of cold beer. Around nine the music started. Saturday each of the musicians from Friday night were accompanied by a very talented band made up of some of the performers playing guitar and harmonica plus a drummer and a base fiddle - they were fantastic and sounded like they had been playing together for years. 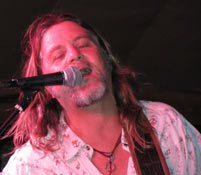 Saturdays line up included everyone from Friday night plus Walt Wilkins and his wife Tina. The music was fantastic and the dance floor was packed with dancers of all ages - a very young (10 to 12 year old) brother and sister were a hoot to watch as the spun and twirled around the dance floor. Sunday morning it was a tad difficult getting our golfers out of bed and rolling for our early morning tee time at Frio Country Resort's 18 hole golf course - The Club at ConCan. What a fantastic course - fun, challenging, and scenic with a picturesque and interesting layout. This course is no walk in the park and it will test you skills but if you pick the right set of tee boxes you'll have a very memorable and enjoyable round. You'll encounter water, some narrow and tight approaches, fairways that are ample and forgiving, challenging elevated greens, dog legs, and enough sand to give your sand wedge a good workout. When we played the conditions were very good and the green fees are reasonable. 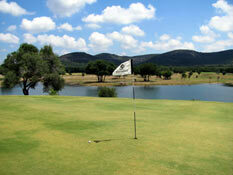 Read our review of The Club at ConCan to lean more about this outstanding golf course. Thanks to a fuzzy head, I don't remember the first three holes but I sure enjoyed the other 15 once the stars were gone, the eyes were fully open, and the head was somewhat clear - I sure love that Advil! The Club at ConCan is also home to a spa with a variety of services (which I could have used after a round a golf) and a fantastic patio and grill. We called the non golfers and had them join us for a good lunch and some cold beer in a very picturesque setting on their patio. I think I could have spent a couple days here! On the way back to our cabin to check out, we decided on one last adventure - a helicopter ride over the Frio River and surrounding hills. For a very reasonable price, Holt Helicopters gave my grandson, son in law, and myself a fantastic helicopter ride over the Frio River, The Club at ConCan, and some very scenic and beautiful Texas Hill Country. 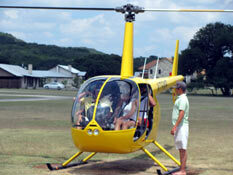 There are no doors on this small helicopter which means we had a thrilling ride with nothing to block our view. And as we flew over the houses, river, ranches, golf course, and rolling hills we could talk to Dusty, our pilot, as well as listen to his comments and stories about the area. What a fun way to end an outstanding weekend. We can't wait to do it again next year.